As we look forward to our first Halloween with Asher, it’s hard not to also look back at how much our lives have changed since this time last year. It’s amazing how much can happen in just a few months, and it’s sometimes hard to believe our little boy hasn’t been here from the beginning! As you know, I love to travel, so now when we think ahead to travel opportunities I’m realizing that our priorities are a little different. Spacious accommodations are the first thing that comes to mind, with all of the little extras that babies need, and quiet and comfort are next on the list. 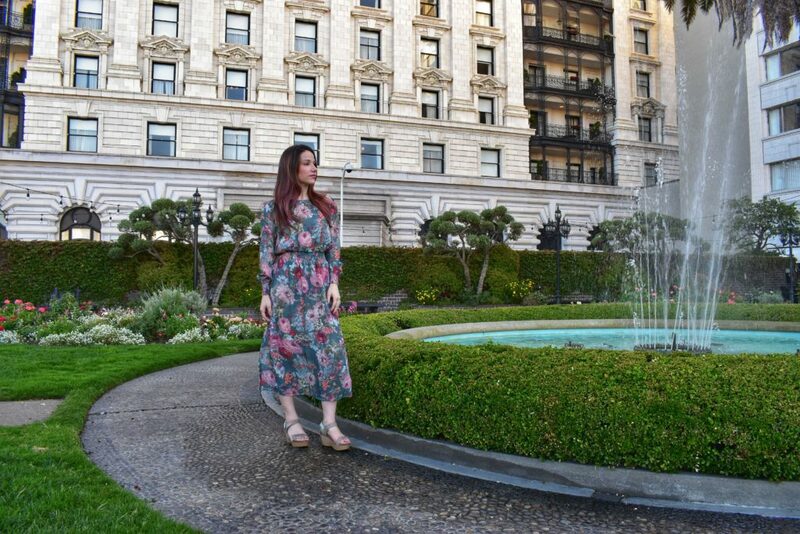 It’s interesting, because our stay at Fairmont San Francisco almost a year ago ticks all of those boxes and so many more, easily. It was an epic stay, and I am not exaggerating! 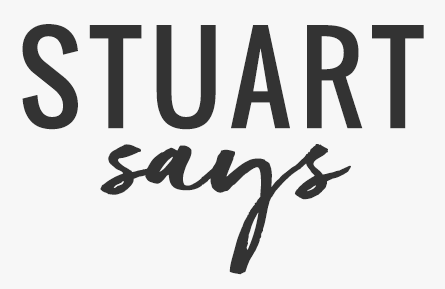 I want to share some details about that trip with you as the year draws to a close, because it is the perfect getaway (romantic or otherwise) especially around the holidays. Fairmont San Francisco sits at the top of Nob Hill, arguably the best location in San Francisco. The flagship hotel of the Fairmont line, it was the first hotel in the United States to include concierge services. It’s a beloved landmark in the community and the no-contest choice of presidents, diplomats, and celebrities who stay in the city. Locals and guests alike come to read in the gardens and just enjoy the spectacular atmosphere. And believe me, it is truly something! During our stay we encountered some locals we didn’t expect: the gardens are home to several beehives and even a bee hotel! Fairmont was the forerunner of the honeybee rescue movement in the industry and several hotels have followed their example since. Besides the large-scale benefit to our environment, guests benefit from the delicious, fresh honey these bees make. The Laurel Court Restaurant & Bar serves it along with their elegant weekend tea service and uses it in their Honey Beer Series, among other things, as part of their dedication to sustainability. You’ll also taste home-grown herbs from the chef’s garden in many of your hotel meals. Speaking of the food at Fairmont, there’s a lot of it to choose from! With three amazing and different restaurants, you won’t want for variety. The Laurel Court Restaurant & Bar offers a seasonal menu in an upscale setting, using locally sourced ingredients and catering to a multitude of dietary needs. We had the best night in the Tonga Room & Hurricane Bar, where there’s dancing Wednesday through Sunday and simulated thunder, lightning, and rainstorms. If you can believe it, this was originally the hotel swimming pool! Now live musicians float on a barge in the middle of the room. The atmosphere is an understatement! For something more laid back, you could try Caffè Cento, where they not only serve drinks (including coffee by illy—yum!) but breakfast, lunch, and some killer pastries that they make in-house. You can also order in-room dining 24 hours a day. See my video guide for a peek at what we tried! Once you see your room, you might just decide to order in for every meal. 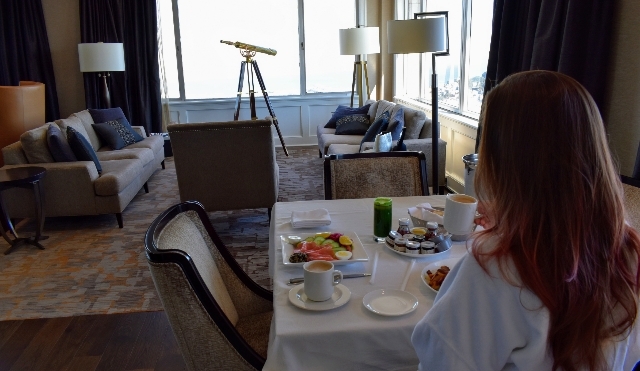 We stayed in the Fairmont Suite in the Tower Building and it was incredible. I can’t tell you how much time we spent just looking out the wrap-around windows at the city and the bay (the infinity bathtub has a particularly fantastic view!) and the views are not all outside the windows, either. The aesthetic inside the suite was very classic-meets-contemporary. Gilded mirrors, Carrera marble in the bathroom, and other upscale accents gave everything an indulgent feel that somehow also seemed just like home after only a few minutes. Though the décor is luxurious, it wasn’t designed just for looks. The gold, copper, and granite color scheme symbolizes the mines which brought people to the area when it was still a sparsely populated territory. Subtle accents of silver are a nod to the fortune amassed by John Graham Fair through his silver mines, which eventually enabled his daughters to have the hotel built. When you’re coming as a tourist to a place with such a rich history, it’s really nice to see that attention to detail. Just because you’re coming to see history doesn’t mean you can’t enjoy modern technology, and Fairmont had us covered there, too! There was a new television in a custom millwork cabinet with a media hub, as well as all of the modern tech amenities you would expect from a hotel such as Wi-Fi, high-speed internet, and access to an executive business center. Staying connected while getting away doesn’t get any easier! It is a great setup for a party! The same custom cabinet that our TV was in had a pull-out bar! The room is designed for entertaining up to twenty people and has the option to connect to a second room with a King bed, but somehow even with just the two of us it still seemed intimate. We had enough space to just stretch out and enjoy the views. Now as a family of three it’s still the ideal suite, with plenty of room for baby gear. Not to mention, Fairmont offers babysitting services! It really is perfect in every way for a romantic getaway or a holiday excursion. We went at Halloween, and there were preparations in full swing for the holiday season already! Each year they construct a giant gingerbread house using house-made gingerbread bricks and royal icing. Last year they used 1,650 pounds of candy! In keeping with Fairmont’s commitment to sustainability, the frame is recycled at the end of the season and the edible portions are composted. When you’re ready for some sightseeing, you can purchase cable car tickets at Caffè Cento. The Fairmont is actually the only spot in the city where the three cable car lines meet, so it’s a great jumping-off point for a day of exploring! Even if you’re only there for a couple of days, San Francisco is absolutely brimming with possibilities. You will not be disappointed! My video guide includes fifteen great things to do and see before you leave (Don’t miss number six! It’s a classic.) But these are only a few of the amazing ways to spend time in this unbelievable city. 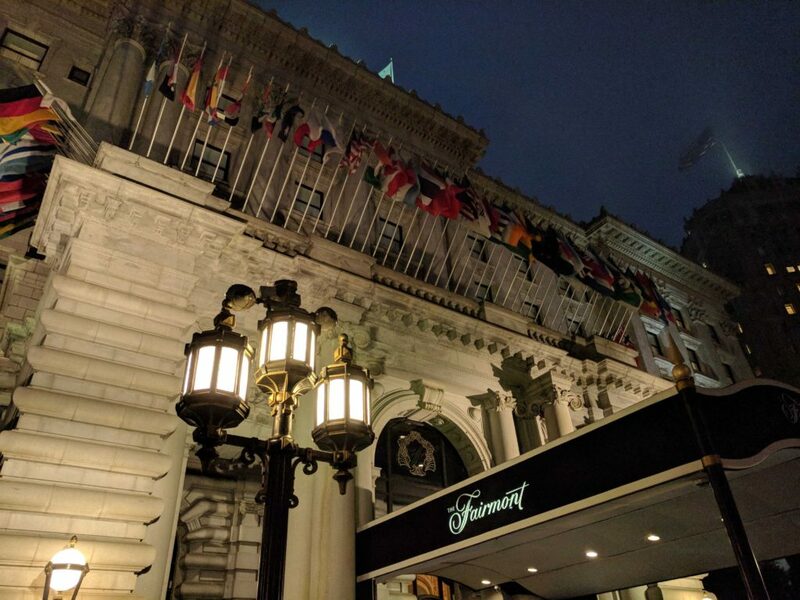 If you’re planning a trip to San Francisco, I hope you’ll put The Fairmont on your list for a luxurious stay or a world-class meal. It’s definitely a one-of-a-kind accommodation! We loved everything about our time there and will definitely be going back with out little one! What are some of your do-not-miss San Francisco experiences? 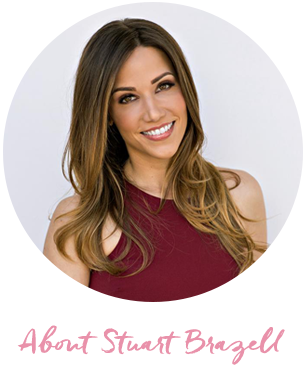 Also read my Paso Robles Travel Guide! The hotel seems super awesome! How i love San Fran! Thanks a lot for the great article. I’ve never stayed at a Fairmont hotel but I love the way they look! Looks like you had an amazing time! You look stunning. The hotel seems super amazing! I’ve always enjoyed staying at Fairmount properties. If I ever visit San Francisco, I have this on my where to stay list. Should you ever travel to Quebec City, consider staying at the Chateau Frontenac, which is another gorgeous Fairmount property. I would love to visit this Fairmont Hotel. It looks so lovely. I love the decor and all. I’ve been meaning to go to San Francisco for a while! This definitely looks like an amazing place to stay! Perfect timing! I will be in San Francisco for 2 days next month, didn’t reserve at the Fairmont but it looks gorgeous! San Francisco is really a nice place to visit. I will def add this to my bucket list and hope to be there someday! This is the place that most people wanted to visit and you are so lucky in having a chance to see how beautiful this place is. This is such a perfect place to visit with my family and I am sure we will surely love it. This post is right on the time as I was planning to visit SF soon. I also loved your Hallo costume! Wow, such a detailed post that would be so helpful to plan a great trip to San Francisco. Loving the pictures so much. I want your rob, Its beautiful. I want to go there, it looked amazing!